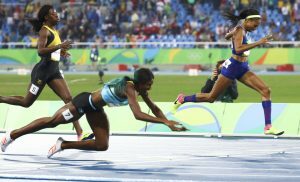 The women’s 400-meter race at the Rio Olympics on Monday took an unusual turn when the Bahamas’ Shaunae Miller dove over the finish line to ensure the gold. Indeed at the Beijing Olympics in 2008, the United States’ David Neville used the same move, ironically, to pass the Bahamas’ Chris Brown to secure the bronze medal. Biles will have another chance to stand on the podium in the final gymnastics event on Tuesday, the women’s floor exercise. Wilhem Belocian false starts in his first Olympics. Japanese pole vaulter Hiroki Ogita failed to qualify in his event for another reason when a body part got in the way. #Rio2016's celebrations have been off the charts.